What is PowerShell DSC, and what can I use it for? 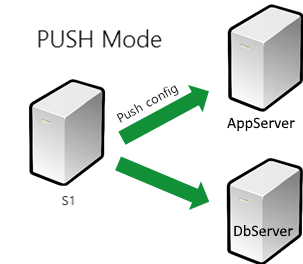 Put simply, you can use DSC to define the state of a server or set of servers, and when deployed, you can rest easy that those servers will be in the state you’ve dictated for them – even if someone RDPs into your server and changes one of your settings – DSC will know about it and change it back automatically. In this post, I’m just going to cover the high level – I’ll follow up with some more details including specific examples of how to carry out certain tasks, such as enable RDP for administrators on a server, make sure SQL Server’s installed, etc.. Which brings me to my first DSC observation, having played with it for some time, I’ve come to the conclusion that there’s not an awful lot you can’t do with it. This is a good thing, but as with all good things, judgement as to how far you go and what kinds of things you do lies with the implementer. You could use it for making sure pre-requisite settings, features and services exist on your application server – thereby adding some additional protection against configuration errors and inconsistent setup documentation. You can also use it to take a blank Windows Server installation and install SQL and TFS Server on it and use this as your way of producing a line of business server. I’d recommend the former, but maybe not the latter – there are in my humble opinion, better ways to crack this kind of nut – preparing a server image as a template for example, using sysprep to generalize it and mount it. How do I get the configuration to my servers? A service called Local Configuration Manager does the work here. The configuration is executed on each target server by the windows Powershell DSC engine – the DSC Local Configuration Manager (LCM) (https://technet.microsoft.com/en-us/library/dn249922.aspx). This engine is responsible for acquiring the machine’s configuration and applying it – it accepts various parameters to control how it goes about doing this, eg. How frequently it should check for new configurations, how the configuration files should be obtained, etc. There are two distinct modes of operation for the LCM to be set to – Push or Pull. The server (S1) uses a PowerShell command to send the configuration data to the target servers. The target servers must be online and configured to be able to listen for configuration updates. The server (S1) is configured to listen for requests from the target servers. The target servers will make requests to S1 on a regular basis, only downloading configurations if they vary from the current applied configuration. They will then apply the updates. Once the servers have been setup, there is no need to check or maintain configurations on the target servers – DSC will manage that on your behalf. 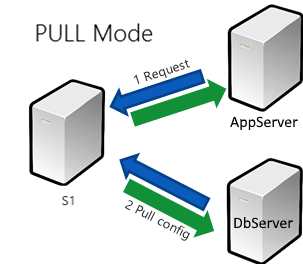 DSC was designed to ensure that a server or suite of servers (environment) is configured as expected, and any configuration changes made inadvertently during operational use which would otherwise lead to the environment not functioning correctly, are rectified automatically, removing the need for IT teams to spend time investigating and correcting configuration errors. DSC is also used to carry out the initial setup of a new server, and is commonly seen in virtualized environments for the automatic provisioning of new VMs, removing any risk of human error, or time spent following lengthy scripts and documentation. As a DevOps tool, developers and testers can benefit hugely by being able to provision complex infrastructure environments in a self-service fashion, rather than submit requests for environments to be built and configured by an IT team. Microsoft’s Azure supports DSC, and its use is widespread when setting up Infrastructure as a Service environments (IaaS). In this respect, the original VM image plus DSC configuration are effectively a template for a server, and can be used to scale up IaaS environments horizontally. Although configuration files are created as PowerShell Scripts, the actual deployment to target servers is achieved via a file format called Managed Object Format (MOF), http://www.dmtf.org/sites/default/files/standards/documents/DSP0221_3.0.0.pdf. MOF is a standard for describing managed objects that conform to the Common Information Model (CIM). http://www.dmtf.org/sites/default/files/standards/documents/DSP0004_3.0.1.pdf. This step allows other server types to be configured by DSC (not just Windows Operating Systems) – MOF Files can be used to set state on Linux servers, for example. The initial script, being PowerShell, enables the use of parameters and configuration data files, and rich scripting control over how the PS1 file is built. When the configuration is executed, one MOF file per target Node (server) is generated in the configuration subfolder. In order to deploy any resource via the Pull web service download manager, a checksum file is also required to be generated. The checksum is used by the target server to validate the content of the configuration, and determine whether or not the configuration content matches the currently applied configuration. That completes the 101 overview post, coming next is the implementation post, including how to setup your authoring environment, the pull server, and sample tasks and code for completing the common tasks mentioned earlier.